ene-phant는 최소형 스마트한 사이즈의 AC/DC전자부하이며, 옵션선택시 회생부하까지 가능한 신개념 전자부하입니다. 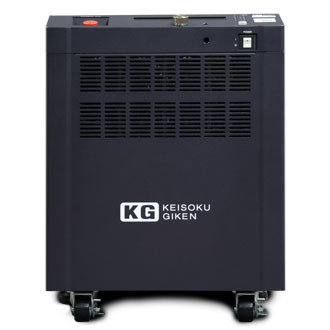 It is adapted to 14 difference loading powers and AC input types by paralleling 2 or more units. • Single models can be used at 3-phase application by the combination of multiple units. 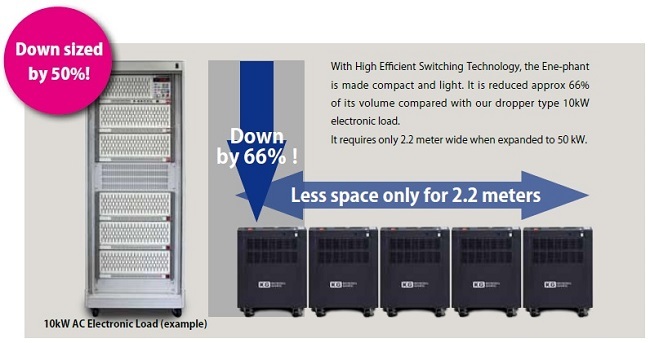 • It is adapted to single phase, 3-wire system by connecting multiple single phase units. 단상 2선, 3선부터 3상 3선까지 연결가능합니다. It can simulate Capacitive load (C), Resistive load (R) as well as Inductive load (L) all by itself while it can set the current phase from 0 ～ -1 and 0～+1. The phase lead and the phase lag can be set by the angle as well (-90deg ～ 0 ～ +90deg). simulate such as capacitor input rectifier circuit of switching power supplies. As voltage rating of electronic devices are increasing especially devices for electric vehicles, it is designed and rated as 680VDC max. 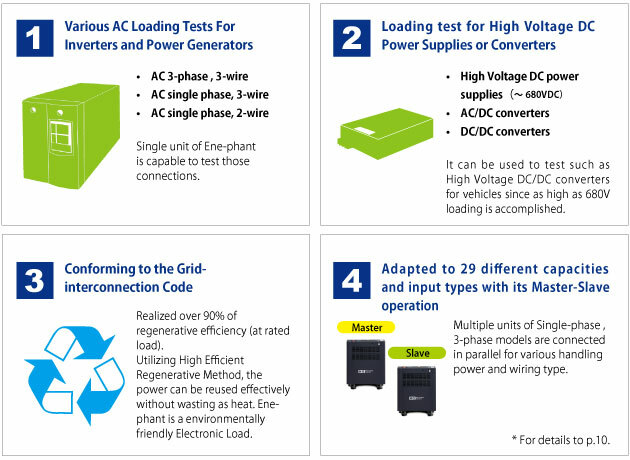 From high power DC/DC converters to Chargers (AC/DC converters), Quick-Chargers, High Power Batteries, the following 5 functions are equipped. The I/V characteristic test of PV panel is possible as it is incorporated MPPT mode. Without using a power conditioner which is incorporated MPPT feature, this electronic load alone can test PV directly for various parameters. It delays the current start point from the rising edge of the DCvoltage. It is selected among 1, 2, 5 and 10 seconds in accordance to the characteristics of the DUT. Isolated voltage and current monitors (BNC output) are available as option. USB, RS232C and PLC interfaces are equipped as standard which enable it to control remotely. In addition, GP-IB and LAN (Ethernet) interfaces are available as option. There are contact input and analog signal (0 ～ 10V) input from PLC for external control. External control is simply possible through PLC without communication or command. Optional infrared remote controller is convenient. This can be used as a numeric key pad to enter such as the current value. The following 8 protections are incorporated as to protect the electronic load. Emergency Stop switch is on the front panel which enables GATE BLOCK of the power line. There is a transformer which is isolating the electronic load and the grid. 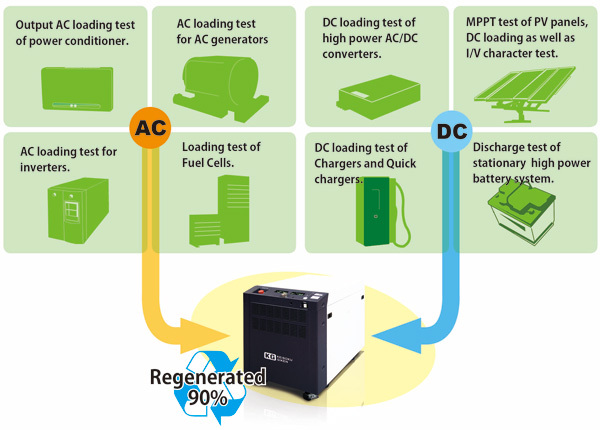 Over 90% (at rated loading) of power is reused by the regenerative circuit by our technology which is backed by the bi-directional product development for smart grid. This brings big change on electronic load testing from “Wasting Power as Heat” to ” Recycle Electronic Power”. It is equipped with Grid Monitor and Protectors which are found in such as power conditioners available in the market. With those monitor system and protectors, it can recycle electronic energy and used safely manner. Input voltage of 220V and 230V, 3-phase, 4-wire are also available as option.